Six years is a long time to wait for a new Frank Peretti book. Was the 500+ page novel Illusion worth the wait? Despite the storyline being a long way removed from anything the seasoned author has previously written, this question can be answered in the affirmative. Magic. Illusionists. Love. Playing God. Time travel. These are the headlines which make up the mega-themes of the book. Illusion centers around popular magic duo Dane and Mandy Collins. The blurb of the book explains how after Mandy’s death, Dane meets a 19 year old magician who is in every respect identical to his late wife. While this information isn’t a spoiler, it does mean that the overall direction of the beginning of book is somewhat predictable. However, Peretti writes with such style, energy and mystery that the novel is still a page-turner in the early chapters. As the book progresses, the storyline gets stranger with elements of conspiracy and science coming into play. The latter section of the book is complicated and mind bending, standing in stark contrast to the earlier, more straightforward storyline. The plot is far removed from those contained in Peretti’s usual supernatural thriller books. But despite lacking an obvious villain, the story is captivating. Not all of the characters are well developed, but the important ones are full of substance and life. Illusion is a welcome change of direction for Peretti. While I agree with the near unanimous comments from readers that the book is about 100 pages too long, nothing would have hindered me from finishing the novel. Like many of Peretti's novels, Illusion deserves to be made into a Hollywood blockbuster. The author has turned his hand to screenwriting in the past, but progress has been slow. But the book is so well narrated, with vivid dialogue it surely wouldn't take too much editing to get the story to film. You could argue that none of Peretti’s novels have matched the quality of his first offering: This Present Darkness. Nevertheless, the author has maintained his hard-earned and well-deserved reputation as a master storyteller. 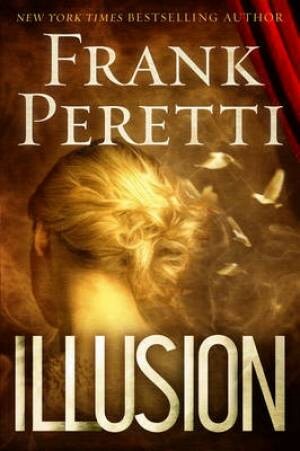 So whether it’s angels and demons or magicians and illusionists, as long as the words “Frank Peretti” are on the cover, you won’t go far wrong. A brilliant read - loved it. Yes, a real departure and I did wonder where it was going, but boy! I enjoyed the journey!